Joel Gonzalez Bonilla of Spain delivers a kick to Mexico’s Damian Villa in the men’s under 58kg final match on the second day of the 2009 WTF World Taekwondo Championships at the Ballerup Super Arena near Copenhagen, Denmark on Oct. 15, 2009. 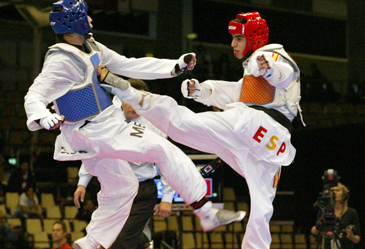 Spain showed its supremacy in taekwondo, as it won two gold medals on the second day of the 2009 WTF World Taekwondo Championships in Copenhagen, Denmark on Oct. 15, 2009. China also surged ahead with one gold medal. In an action-packed men’s -58kg final match, Spain’s Joel Gonzalez Bonilla brushed aside a stiff challenge from Mexico’s Bamian Villa to earn his country the gold medal. Argentina’s Mauro Crismanich and Afghanistan’s Sayed Rezai shared the bronze medal in the men’s -58kg category. In the women’s -49kg division, Spain’s Brigitte Yague Enrique beat Russian Anna Soboleva to earn her country the second gold medal at the 2009 WTF World Taekwondo Championships. The bronze went to France’s Yasmina Aziez and China’s Jing-yu Wu, who won the gold medal in the women’s -49kg division at the 2009 Beijing Olympic Games. In the women’s -57kg division, China’s Yu Hou defeated Italy’s Veronica Calabrese to win the gold medal. The bronze was shared by Spain’s Andrea Rica Taboada and Chinese Taipei’s Pei Tseng. Korea failed to win any medal on the three weight categories. The 2009 World Taekwondo Championships, which takes place at the Ballerup Super Arena near Copenhagen, drew a total of 928 athletes, including 558 men, from 142 countries, the largest ever in WTF Championships history. Electronic body protectors and an instant video replay system are being introduce at the ongoing World Championships, which continues until Oct. 18.